British Columbia’s Tyler Tardi kicked off his campaign to win a third straight national title as the 2019 New Holland Canadian Juniors got underway today in Prince Albert, Sask. Tardi and third Sterling Middleton have two consecutive national and world championships behind them, and this year they’ve brought a new front end to help keep the streak alive. Matthew Hall, playing second, joins the team after relocating from Ontario – Hall skipped the Ontario team that lost to Tardi in the 2017 gold-medal game. Alex Horvath takes over the lead position, with Paul Tardi, Tyler’s dad, as coach. In the opening draw, the B.C. foursome had no problem overpowering Trygg Jensen of the Yukon, scoring four in the eighth to cruise to a 10-2 win. Also in the win column in the opening draw was Northern Ontario’s Tanner Horgan, making his sixth consecutive appearance at the national Junior championships. Horgan, who lost the final to Tardi last year, needed a deuce in the final end to defeat Graeme Weagle of Chester, Nova Scotia, 7-6 in the opening draw. Weagle, the gold-medallist at the 2018 Under-18 Nationals, is taking his first crack at an Under-21 national title. The 2018 bronze medallist, Manitoba’s J.T. 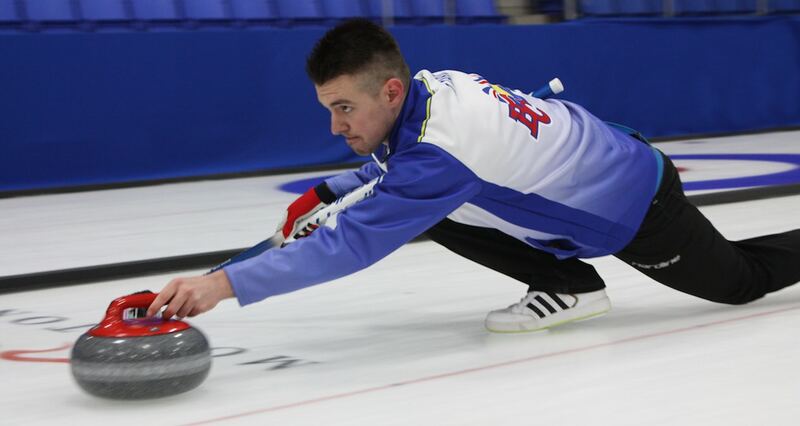 Ryan, backed by third Jacques Gauthier and a new front end of Jordan Peters and Cole Chandler, also started the round robin with a win, defeating Quebec’s Vincent Roberge, 6-3. In women’s action, the 2018 bronze medallist from New Brunswick, Justine Comeau, got off to a slow start in the opening draw with a 7-3 loss to Quebec’s Laurie St-Georges in a rematch of last year’s women’s semifinal. But Comeau and her Fredericton team of Emma Le Blanc, Brigitte Comeau, Keira McLaughlin, alternate Erica Cluff and coach Tim Comeau bounced back on Saturday afternoon with a 9-5 win over Prince Edward Island’s Lauren Ferguson. Also in women’s Draw 2 action, British Columbia’s Sarah Daniels, hoping to improve on her 2016 silver medal, started strong by winning her first game 14-0 over Nunavut’s Sadie Pinksen. Selena Sturmay led Alberta to a 10-3 win over Northern Ontario’s Kira Brunton, the 2018 Under-18 champion. Saskatchewan’s Sarah England, daughter of famed Canadian curler Sandra Schmirler, skipped her Saskatchewan foursome to a 10-5 victory over Newfoundland and Labrador’s Mackenzie Glynn. Action continues in men’s and women’s play on Saturday (8:30 p.m. ET) at both the Art Hauser Centre and the Prince Albert Golf & Curling Club. For the first time, selected round-robin games from the New Holland Canadian Junior Championships will be streamed live at Curling Canada’s Facebook page, which you can access by CLICKING HERE. Find all the scores and standings by linking to the scoreboard on the event website, here: www.curling.ca/2019juniors.